It's almost time for the current Stampin' Up! In Colors to retire. Powder Pink, Lemon Lime Twist, Tranquil Tide, Berry Burst, and Fresh Fig will be gone May 31, 2019. Some of the products will be gone long before then. If you like any of these products, I suggest you order them early. Our annual retirement list goes live today, Monday, April 15, 2019. Be sure and check out your favorites, and get them before they are gone. 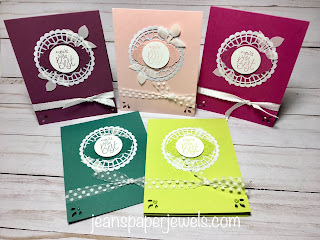 I used one of the stamps from Label Me Pretty along with the Pretty Label Punch on today's card. The sentiment was punched out with our 1 1/2" Circle Punch. I layered a couple of Vellum Leaves from the Leaf Punch on one of our Pearlized Doilies. 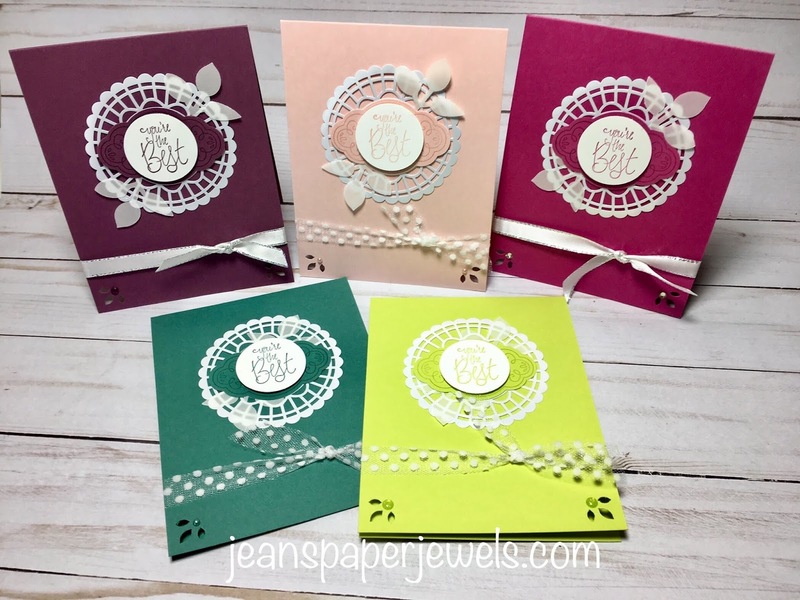 I also accented the bottom corners using the Detailed Trio Punch, and finished the cards off with 5/8" Polka Dot Tulle Ribbon, or 3/8" Metallic-Edge Ribbon. The In Color card bases are the only products that are retiring. Everything else is in the new catalog.